Dr. Kirk Riechard, left, explains the mechanics of hip replacement to patient Paul Kimball. Paul Kimball's hip replacement journey started when his back went out. "It was like, Wham! I couldn't move," Kimball says. "It was a couple of days before I could walk again. I never had that experience." A year later, it happened again. The South Hill resident was 50 years old at the time, and enjoyed an activbe lifestyle including downhill skiing, water skiing and softball. 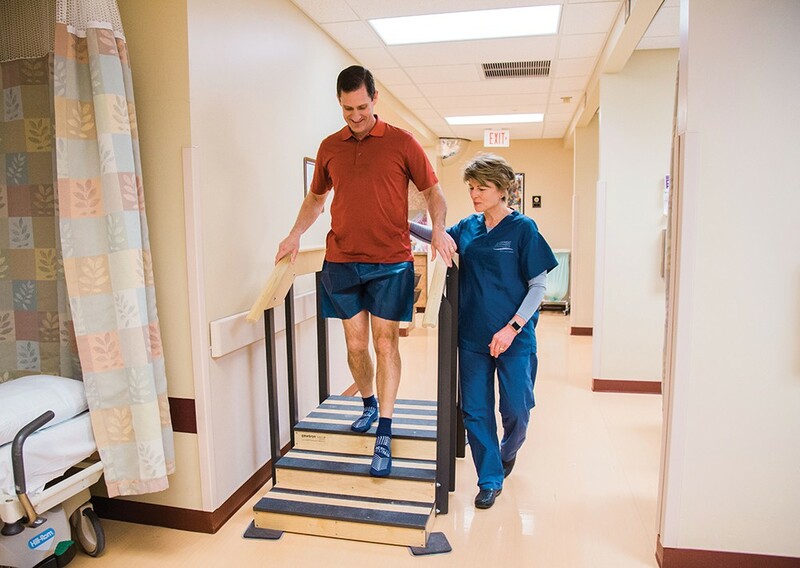 He decided to go to a physical therapist, who watched him walk and tested his joint mobility. "There's nothing I can do for you," Kimball remembers him saying. "Your right hip is shot." He was surprised at his therapist's diagnosis. "I remember thinking it was strange because at that point, I didn't have much in the way of symptoms," he says. "But before long, my hip was so bad, I had to mentally prepare to get my shoes on." The physical therapist recommended A. Kirk Reichard, an orthopedic surgeon at Northwest Orthopaedic Specialists in Spokane. Reichard replaced Kimball's hip in November 2015, in a surgery that went smoothly. Kimball spent one night in the hospital and a few days in bed at home. A home health nurse came by to check his wound and vital signs, and a physical therapist took him through some basic exercises. By the next spring, Kimball was back playing softball. But then his other hip started to bother him. A decade ago, patients could expect to spend three to five days in the hospital after a hip replacement, with some patients going to a rehabilitation facility to recover enough to return home. The advent of the anterior, or front, approach to the hip joint replacement, a technique that moves muscles aside rather than cutting through them to access the joint, changed recovery times dramatically. But until very recently, the surgery required at least one night in the hospital. Outpatient surgery coordinator Sandy Phillip assesses Kimball’s stair climbing. 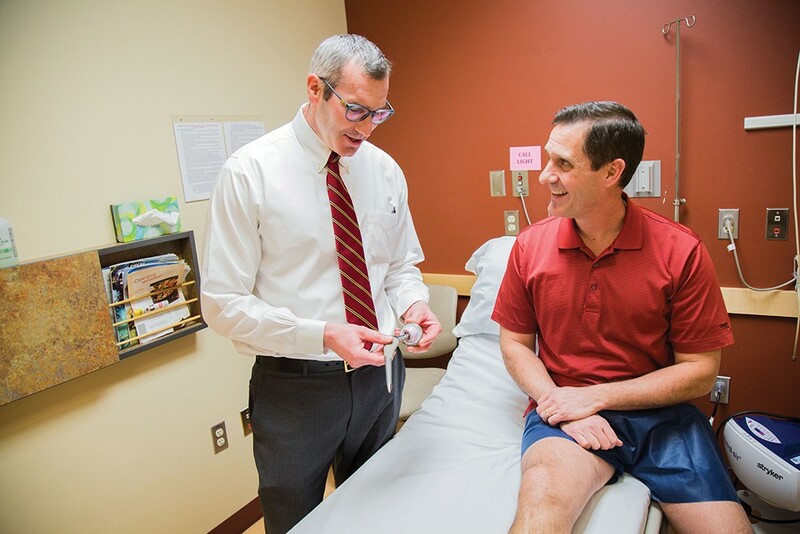 Last November, Northwest Orthopaedic Specialists made the move to add outpatient joint replacement procedures to their services for healthy patients who fit their strict criteria. The group reports it has done 19 outpatient procedures since Nov. 2, 2016, and all have been successful in terms of recovery, reduced or eliminated pain and satisfaction on the part of the patient. "This is a common theme in medicine — transitioning from inpatient procedures to an outpatient setting — and for a lot of reasons," Reichard says. "We appreciate the necessary resources available in a hospital, but (with this program) we don't utilize them. They amount to a huge expense for the insurer as well as the patient. ... There will still be lots of people who are going to need to be cared for in the hospital, orthopedic patients who might also need a cardiologist, internal medicine or additional interventions," Reichard says. But for the healthy patient, the same-day surgery approach can work well. And should something should go wrong in the operating room, the equipment, medication and trained personnel necessary to handle an emergency are readily available. "I started noticing that same pain, and this time, I knew what to look for," Kimball says. "As soon as I laid down, my left side would start to ache, and it took 30 to 45 minutes before it would slowly subside. "I called my doc, got a steroid shot, then went to the physical therapist, and he did a bunch of strength and mobility tests. He said the left hip was impinged, and mobility-wise, it was worse than the right hip." Kimball's steroid shot, which had worked so well on his back, gave him relief for just two days. He made the decision to have his left hip replaced, but this time, Reichard offered him the option of doing the procedure in one day — Kimball would be admitted in the morning and back home that afternoon. "I had a good experience the first time," he says, "and the idea that I could go home right away — no catheter, no increased exposure to stuff like MRSA — it all sounded good to me." Sandy Phillip, the Outpatient Total Joint Replacement Coordinator for NWOS, provides an important part of the program in terms of patient screening, planning for the surgery and education. She worked with Kimball to make sure he was a good candidate and was aware of what same-day surgery entailed. "This (outpatient) surgery isn't for everyone," Phillip says. Once a patient is seen by a total hip or knee replacement surgeon and that doctor feels outpatient surgery might be appropriate, Phillip contacts them and determines their eligibility, "based on their health and their support system at home," she says. "We call that support person the 'coach,'" Phillip says, "and they come to the pre-op meetings (where the procedure and recovery is explained), are there the day of the surgery and then spend five days with the patient after the surgery." Specifically, the criteria is that the patient must be under 65 years of age, use no nicotine products, have no other major medical problems such as heart disease or cancers, not require narcotic medications for chronic pain, go through a pre-surgery education class where they learn how to outfit their homes for the safety and comfort of the patient, and have a caregiving team at home to help with daily chores. The outpatient surgery is also enabled through use of proactive methods of pain control, including an array of pre-surgical nerve-blocking techniques and longer-acting narcotics, as well as methods for managing post-surgical blood loss. Kimball says the difference between his two surgeries was remarkable. After the first surgery, he says he woke up feeling as though he'd been "knocked out." After the second surgery, "I came to and was wide awake. They put me into a chair right away. After an hour or two, I was up walking on crutches. By five that afternoon, I was ready to go home." With the same-day surgery, Kimball says he "felt better immediately." He could shower over the waterproof bandage the staff had given him. He could tie his shoes again without pain. Same-day patients don't leave the hospital with no further monitoring, however. A home health nurse sees patients the day after they return home. The nurse is there to "make sure the patient's pain is controlled, the incision looks good, their bowels are moving — everything that will help them get back to their normal lives," says Sean Fetters, a registered nurse and case manager for Kindred at Home. A physical therapist works on mobility of the replaced joint, and helps ensure that the home environment is safe and comfortable.